At the core of the wide popularity and success of the African Violet is the dramatic variety of the plants, in terms of both flowers and foliage. 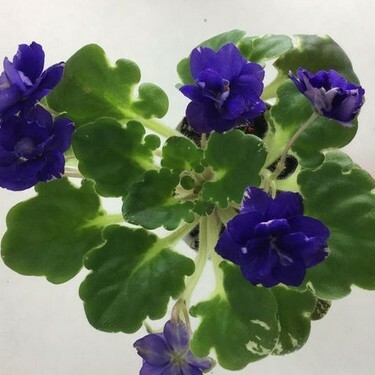 Those who are new to the African violet world might assume that the plant’s features are restricted to the blue flowers and plain green leaves of the species plants and their mother’s and grandmother’s plants. After one hundred years of cultivation, modern African violets are found in a variety of flower types and leaf types. The flower colors may be dark blue, as in the original plants, but may also include white, pink, lavender, red, fuchsia, coral and a shade approaching “true” red. The newest plants also have flower colors of green, ivory and yellow. The flowers may be of a single color, or may have darker tips, contrasting eyes, colored edges, spots and streaks, or be multicolored. The flower petals come in different forms. There are singles, “stick-tights”, semi-doubles, full doubles, fringed flowers, ruffled flowers, star-shaped flowers, wasp-shaped flowers and bells. Just having a collection of plants that show all the possible flower colors and combinations would involve hundreds of specimens. Mutations have resulted in the development of varieties with extra blossom parts, most visibly in the form of extra petals. Left to right, these are ‘Blue Boy’, ‘Baby Brian’ and ‘Ness’ Crinkle Blue’. 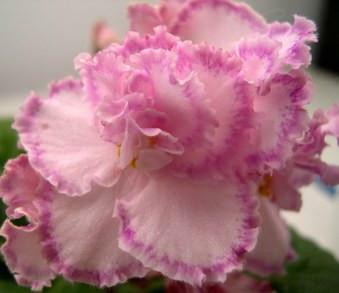 One of the most notable developments in the African Violet has been the mutations of flower parts changing the number of petals. The original flowers with 5 petals are known as singles (ex. ‘Blue Boy’). Flowers with additional partial petals are known as semi-doubles (ex. ‘Baby Brian’). Flowers with extra layers or rows of petals are known as doubles (ex. ‘Ness’ Crinkle Blue’). A sampling of Saintpaulia flower patterns. From left, “Geneva” pattern (picotee), “Thumbprint” pattern and “Fantasy” type. Some of the newer flower mutations in the last 20 years changes the pattern of the color on the petals. Four examples are Geneva edge pattern, thumbprint pattern, fantasy pattern and raspberry edges. Geneva edge is a dominant mutation. It first appeared in 1950 on ‘Lady Geneva’, and has appeared in many hybrids since, including ‘Red Lantern’ above left. The gene is dose dependent with a double dominant (DD) producing a wider white edge than a single dominant (Dd). The thumbprint pattern was released by Optimara violets in 1985 with plants such as ‘Optimara Dali’, ‘Optimara Leonardo Davinc’i and ‘Optimara Monet’. The mutation puts a spot of color in the center of the petals. 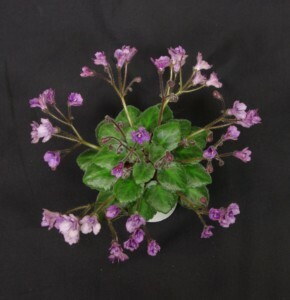 The mutation is also genetic dominant and is available in all African violet colors. ‘Silverglade Beads’ (center, above) is an excellent example of this flower pattern mutation. Fantasy flowers have splashes of one or more different colors against a background color, as in the example above right. This is a dominant mutation, with the best effects obtained in plants with the dominant (fantasy) gene paired with a recessive (plain color) gene. The raspberry edge pattern also appeared in the 1980’s but it is unclear which plant had the original mutation. This dominant mutation puts a layer of darker pink or red color on the petal edges. The gene is linked to pink/red and only shows in this color even on a blue flower. ‘Tomorrow’s Pink Ice’ is one of my hybrids with raspberry edges. 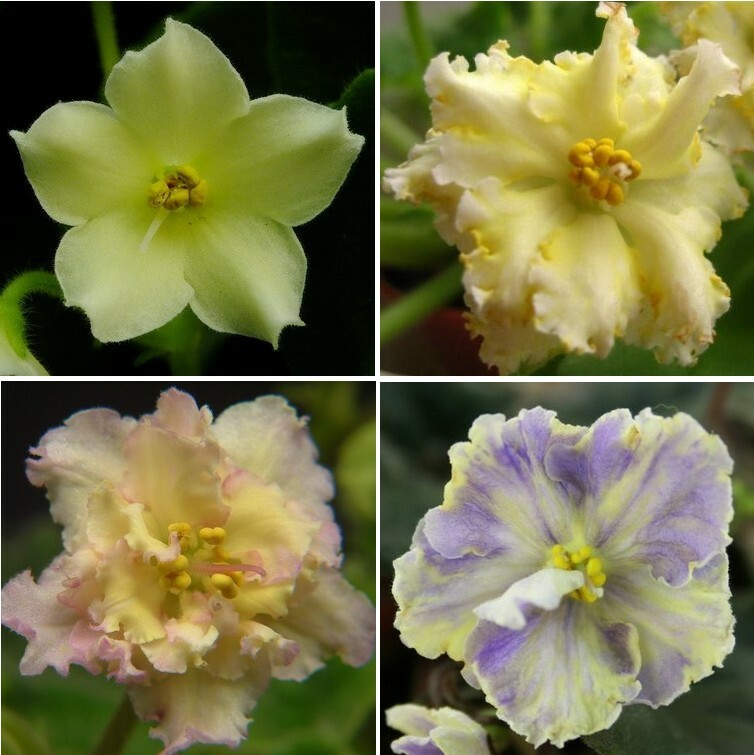 Examples of the “My series” flower color mutation. One of the newest pattern mutations puts a very wide band of white on the outer half of the petal edges. 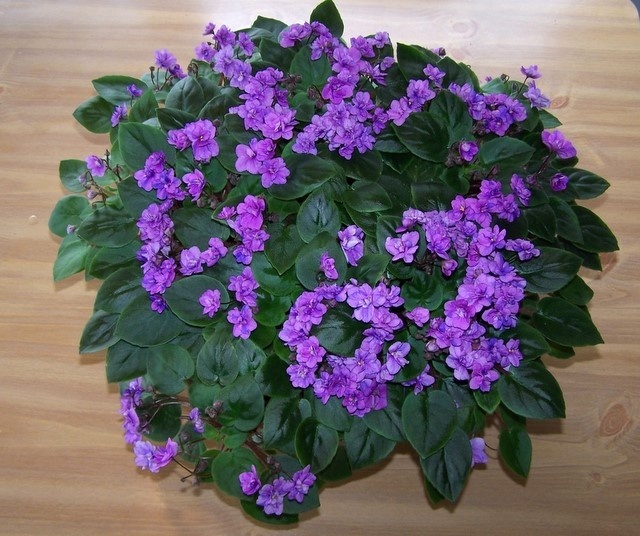 The Optimara “My” series were the first plants with this dominant mutation. ‘Optimara My Dream’ (l) and ‘Optimara My Joy’ (r) are excellent examples of this type. The mutation appears to restrict the distribution of the color on the edges and is different genetically from the similar appearing Geneva edge mutation. African Violet flowers can have yellow alone or in combination with other colors. Among the latest developments in African Violets is the creation of a variety of yellow colors, which is not a naturally occurring color in the species. Yellow occurs as both a plain color and in combination with other tones. The leaves of African violets are no longer just plain green. The leaves may be “boy leaf’” (plain leaves), “girl leaf” (scalloped leaves with a white dot at the base of the leaf blade), longifolia (long pointed leaves), ruffled, spoon–shaped, quilted, wavy, or bustled. The leaves may have green, silver or red backings and can be variegated in white, pink, tan, cream, or yellow-green. The pattern of variegation may be on the edges of the leaf, the center of the plant, or scattered in a mosaic across the leaf surface. A few plants have leaves that change color during the day; being yellow-green in the day and dark green at night. Plants are no longer grown only for their flowers, but also for their colorful and interesting foliage. Saintpaulia ‘Star Wars’ is an example of a modern hybrid with “girl” foliage – scalloped margins with a lighter-colored central vein. Leaf variegation, a pattern of light colors with green, takes two forms. 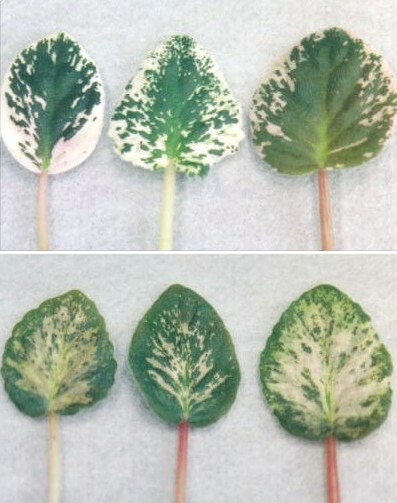 Top is “Tommie Lou” variegation, with lighter areas towards the perimeter of the leaf. Bottom is “Mosaic” variegation, with lighter colors toward the center of the leaf. African violets also come in a variety of sizes and growth forms. The plants may range in size from micro-miniatures that are no more than 3-6 centimeters (1½ -2 inches) across, to large standards that can reach diameters of more than 75 centimeters (30 inches). Many plants grow as a rosette, with leaves radiating from the center like spokes on a wagon wheel. Other plants have multiple growing points and elongated stems that allow them to trail over the edges of the pot. These trailers can also grow quite large, sometimes reaching diameters of over a meter (3½ feet). Add the variety of growth forms, size, leaf types and flower colors together, and the result is a truly impressive number of combinations.